Begin by looking up your Hamilton movement on the Hamilton Serial Number Listings Preserved by John F. Gelson then check the Wadsworth case numbers and years of production on this list for the one that comes closest to yours. If your movement and case are an original combination the years should then be a close or exact match. NOTE: The earliest "Crossbar" cases used a Wadsworth numbering system which changed by the following year. NOTE: The marking "PAT'S PEND'G" was dropped at this point and "PAT 5-22-26" markings began. NOTE: Around 0500000 the case number layout had changed from straight line to a curved "v-shaped" formation. NOTE: By now the case numbers were back to being in a straight line again. About this same time they restarted their numbering having them preceded by an "H" prefix, beginning with H000001 and continuing on both the Model 2 and Model 10 cases. 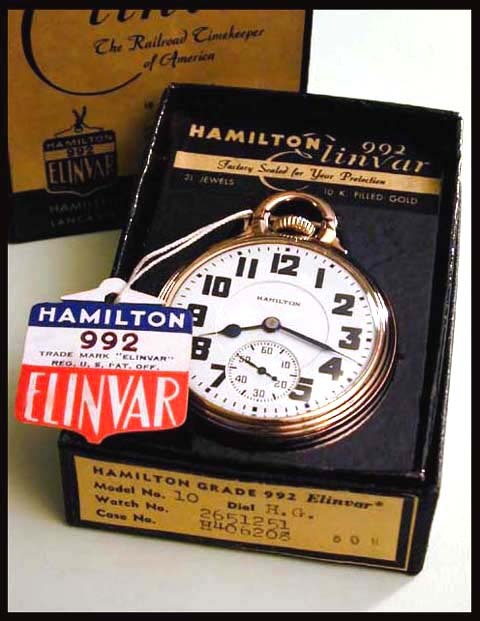 The Case Model 8 was last shown in the 1936 Hamilton Catalog at which time they introduced the Model 10 case which would be kept in the line until it was phased-out during 1947 production. NOTE: We have H799517 with the "PAT 5-22-26" patent date and H814140 which is blank in that area with NO PATENT DATE so it is likely the patent date was eliminated right around the approximately H800000 case number. NOTE: It is important to recognize that between the end of H-prefixes and beginning of J-prefixes during 1948 there were a series of 00-prefix numbers. Of course this often causes confusion but fortunately they had dropped the patent dates by this time so knowing that we can easily distinguish these cases from previous ones. These 00-prefix numbers run to around 0077500 or so, then it appears the first 0 was replaced with a "J" with J-prefix numbers taking over at around J080000 and continue through the end of Wadsworth production as shown below. All information is subject to update as additional documented examples appear. We begin with the model known as "Crossbar" which was the first Hamilton case specifically marketed as being intended for use primarily as a Railroad Model Case. 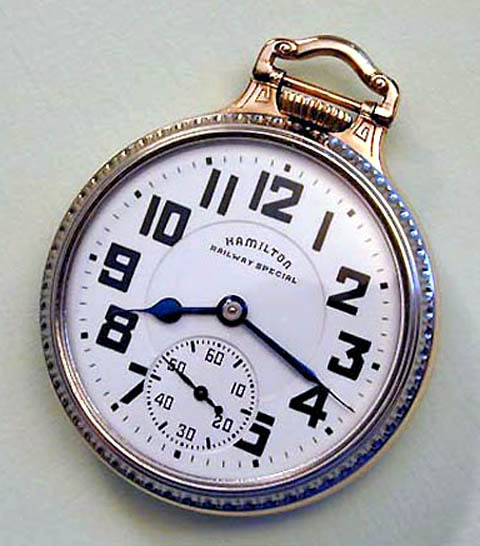 This attractive case was released in 1924 with Wadsworth number around 6888000 or so but then by 1925 the numbering system had changed and we find numbers in the 0200000 area, the numbering system we show from that point on appears to be exclusive to cases made for the Hamilton Watch Company. They made white, green and yellow gold-filled versions of the "Crossbar" case and it appears that by 1928 it was gone from the Hamilton lineup. The highly successful Case Model 2 followed in 1925 and it continued to be offered through 1953 production. Eventually the Keystone and later Star Case 17 would replace it, but that is another subject, here we will focus facts about and descriptions of Hamilton's various Wadsworth Railroad cases. Both the "Crossbar" and Model 2 cases were marked "Wadsworth Quality" and earliest examples had "PAT'S PEND'G" markings inside the case-back. Model 2 numbers began at 0244400 or thereabouts, we have an early Model 2 number 0244488 recorded. Earliest of the Model 2 cases had "chevrons" on either side of the frame just below the pendant. The highly successful Model 2 was produced in 14K white or green, 10K rose or yellow gold-filled as well as white, green or yellow 14K solid gold. They were also made with fancy pattern-backs in the early years, in fact no other Hamilton factory-issued railroad case was produced in such wide variety of choices or for such a long period of time. When the patent for the bar-over-crown design was granted on 5-22-26 that date replaced the "PAT'S PEND'G" marking and they continued to be marked that way until the post-WWII era, during 1947 the patent date was finally dropped and from then-on just Wadsworth, the gold content and case number. By something like number 0390000 area in 1928 the chevrons were gone providing the only real change in styling for Model 2 Cases in their nearly thirty years of production. The evolutionary Case Model 8 which defines the popularity of "Art-Deco Design" with its interesting style and complicated details was first seen during September of 1931 in Hamilton advertisements and it was last in the 1936 catalog when the Case 10 was introduced. The Case Model 10 which also had Art-Deco influences was introduced in mid-1936 advertising and its last appearance was in the 1946-47 Hamilton catalog. Smoothness of design and flowing lines spoke of advancements in transportation and society as a whole. The Wadsworth-Hamilton "Two-Tone" Case Number 3, not to be confused with the 1920s "Model 3" which was made by Fahys, was introduced in 1946 during the booming postwar market. This most unusual case consisted of a 10K gold-filled frame along with stainless steel back and bezel. The back and bezel design is unlike those on Model 2 cases, apparently the dies from early "First-Model" series "Bunn Special" cases were used in this project. Inside these case-backs a circular finish and outside the case-back a vertical finish, both "butler" style. Always check carefully for matching numbers on Number 3 cases for authenticity. 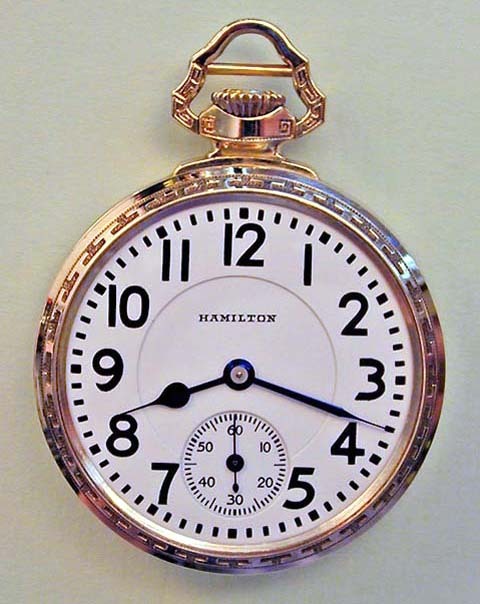 Hamilton discontinued these cases after 1946-47 due to a problem with the stainless steel back and bezel wearing the gold-filled frame to brass upon repeated closure contact and realization these attractive but problem-prone cases are also vulnerable to cross-threading due to the inherent hardness of stainless steel backs and bezels cutting against a gold-filled frame. Inside the stainless steel backs were marked "Wadsworth Base Metal" in keeping with the jewelry trade considering anything but gold or silver as simply base metal. Then on the Case Frame, down low in the center they placed the usual stylized "W" that was the Wadsworth Trade Mark followed by "10K Gold-Filled" which completes the proper marking of all case components. (This marking may be worn down on a heavily-used or over-polished case but it was originally there.) When taken together these markings make perfect sense particularly in the context of the time when these were sold where individually they may seem confusing. Interestingly, these cases would have been properly designated as a "Model 13" were it not for the superstition about that number. For that reason the case in-between Hamilton's Case 12 and Case 14 oddly carries a "Number 3" designation. Finally, during 1948 some of the last new 21-Jewel Bunn Specials were marketed in leftover Number 3 Cases. For that reason if you find a late 161A Type II P Bunn Special housed in a Wadsworth-Hamilton Number 3 Case with no other screw marks please resist the temptation to re-case, you may have found an original combination. Click Late 161A's with Hamilton-Style Cases for more about these unusual Bunn Specials and what to look for. At some point during 1948 apparently Wadsworth had exhausted all their H prefix numbers perhaps as high as even the H999999 number and soon after they commenced using a "J" prefix beginning at about the J080000 number area. But as if to confuse future collectors in between there were 00-prefix numbered cases. For additional specifics on this odd numbering, see the special note in the 1948 area of our case listings above. 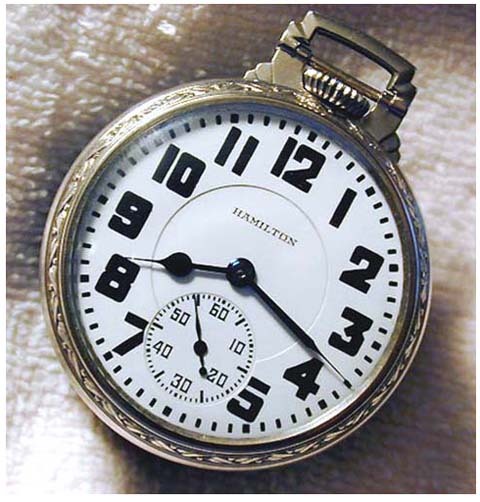 Then in 1951 the Wadsworth Case Company was sold to the Elgin Watch Company which one might conclude had something to do with Hamilton deciding to phase-out their use of Wadsworth cases. The J-prefix numbers on Model 2 Wadsworth cases evidently ran to about the J396000 area by the time the very popular Wadsworth Model 2 was discontinued by Hamilton during 1953 production. As the Wadsworth Case Models 8 and 10 and later Number 3 were introduced they assumed the same numbering system as the Crossbar and Model 2 had used. Wadsworth was the only case company to consistently number their cases in chronological order. 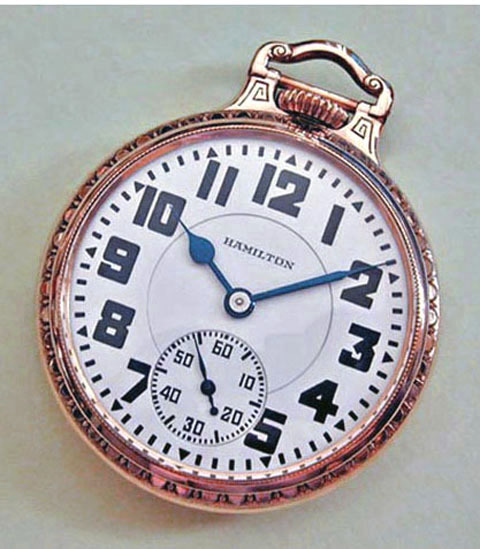 Other Wadsworth cases used on various Hamilton watches such as their 12-size and 10-size factory cased pocket watches along with Hamilton wristwatches employ the same numbering system as the Hamilton Railroad cases discussed above. Wadsworth-Hamilton cases came in varying tones or colors. As explained above, the "Cross-Bar" case came in White, Green and Yellow as did the Case Models 2 and 8 but the Model 10 came only in Yellow whereas the Number 3 was produced using a unique combination of Yellow-Gold-Filled frame mated with Stainless Steel back and bezel, the back oddly carried a "Base-Metal" marking. There were Solid-Gold versions of the Case Model 2 and they came in White as well as Green in addition to Yellow. Each of the Hamilton Solid-Gold Railroad Model cases are very rare and highly sought-after by collectors. For additional information see our "Hamilton Solid-Gold Railroad Cases" topic. 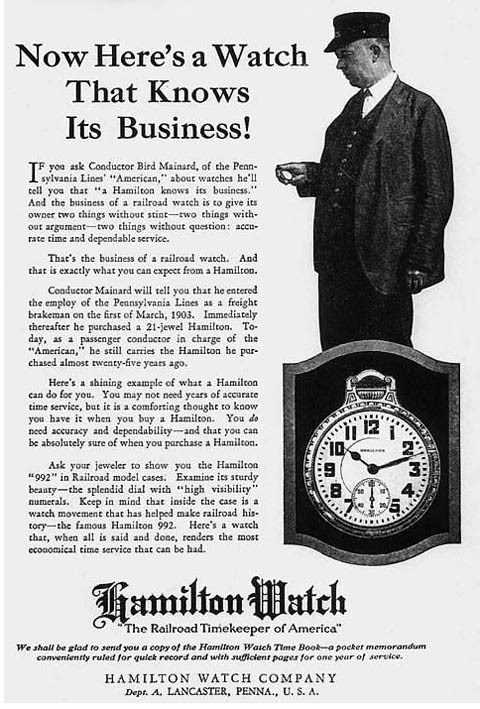 From the 1920s to the 1950s Wadsworth-Hamilton Cases were often featured in Hamilton advertising. The one shown below was part of a 1927 promotion aimed directly at railroad employees, that watch case is of course the Model 2 which was immensely popular during nearly thirty years of production. We will continue expanding this area with additional comments, a descriptive synopsis along with additional pictures of Wadsworth cases for Hamilton Railroad Watches.